Please don't think I'm throwing shade at By Terry from the title of this post. On the contrary. Everyone knows that the Ombre Blackstars are the creme de la creme when it comes to eyeshadow sticks and I concur, but frankly, I'm rather bored of hearing about them. There's only so many times you can read the words 'holy-grail' before your interest wanes, purely because one particular product is overdone. 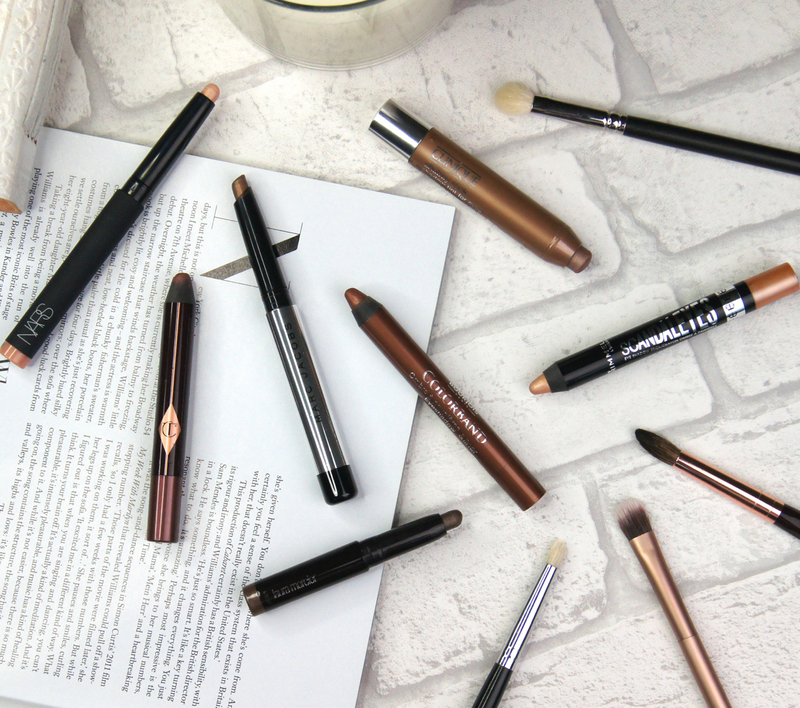 There's a plethora of eye crayons I rate that hit the high-end, mid-range and affordable markets, so I thought I'd plunge them into the limelight for a change. 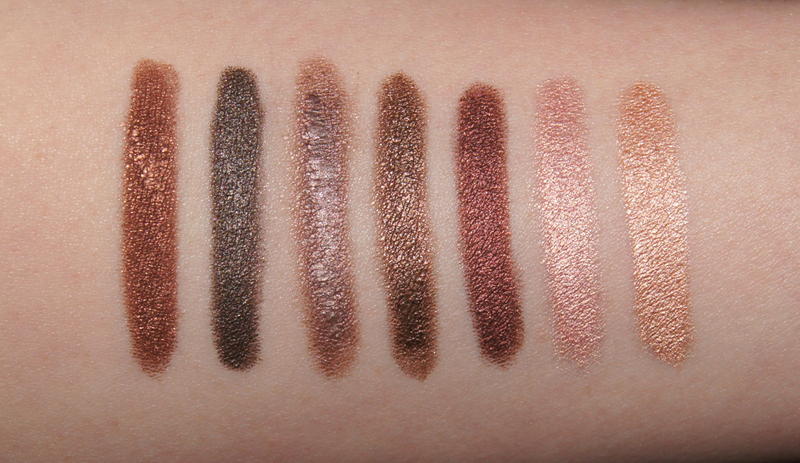 First up, we have the relatively new Nars Velvet Shadow Sticks. As the name suggests, these shadows start off as a cream, but dry down to a velvety, satin finish. As a result, you do have to work quickly with them and it's best to apply them onto bare skin one eye at a time, rather than over concealer. But, once blended out, the shadow is super long-lasting and resistant. I can literally rub at my eye and the colour will stick firmly in place and only oily makeup removers can completely take it off. Nars are usually one of the best brands for vast shade ranges, but there's currently only eight colours available of these shadow sticks. Each one is rich in pigment and there's some really exciting, unique colours in the line, though. Aside from the cutesy name which makes me cringe, I adore the unique formula of the Marc Jacobs Twinkle Pops. Being infused with 'pure alpine snow water from the Swiss Alps' (fancy schmancy), these shadows have a very slick, gel texture that feels instantly cooling and hydrating. Despite looking thick and creamy, they feel light and provide a water-like sensation. Creating a metallic, chrome-effect, the finish also has a wet-look shine. Perfect for special occasions, they look dazzling on the eyes and the more you blend the colour, the more prominent the finely-milled shimmer becomes. One of the most long-wearing formulas in my collection, these shadows set fairly quickly and do not budge all day/night. In my eyes, makeup-maestro Charlotte Tilbury can do no wrong. Her whole makeup line not only looks dreamy, but the quality is top notch too, with the Colour Chameleons being another triumph. Designed to accentuate different eye colours and make them really pop, Tilbury's creations are split into pairs to cater for both day and evening looks. The range of colours is stunning and all create the look of crushed gemstones on the eyes, thanks to the addition of synthetic sapphire within the formula. The pigmentation of these eyeshadows sticks is insane, without needing to use lots of pressure when applying. Gliding onto the skin easily, the pencil doesn't drag the delicate eye area at all and the colour stays looking bold until I remove my makeup. My only gripe about these sticks is that they need sharpening, which makes them a little less convenient to travel with. I discovered the beautiful Caviar Sticks after picking up a gift set one Christmas and I've been hooked on them since, which I shared in my full review. To get the ball rolling with my compliments, I'll start with their gorgeous texture. Very soft and creamy, the shadows feel almost mousse-like and simply glide on like a dream with no fuss. Easy to smudge and blend, you have lots of time to work with the product before it sets. I find these best for creating more of an effortless, smokey effect rather than a completely perfected look. A little product goes a very long way - even with just one swipe of the stick, the colour is opaque. In my experience, once set they don't crease, fade or smudge, but if your lids are very oily you may want to prep with a primer underneath, as they're so creamy. Of all the brands in my line-up, Laura Mercier offer the most shades, but they're also the most expensive. To get the best value for money, I recommend picking up a set that will inevitably appear at Christmas time. If you can wait that long, that is! For a change in consistency, we have the Clinique Chubby Stick Shadow Tints. Having a firmer formula and sheerer pigmentation, these shadows are totally fool-proof. Thanks to the drier texture, they aren't at all messy to use and blend really quickly to give a smooth, soft finish that feels weightless. As the crayons are quite fat, hence the name, they allow for a speedy application. You may not be able to be as precise with them, but they're perfect for a simple wash of colour over the whole lid. Creating more of a haze of colour, they're ideal for prettier, daytime looks, but the coverage is buildable and layering the shadow does amp up the intensity. The shadow can start to cake if you wait too long before adding more, though. After setting, the shadow doesn't move, but I find some of the lighter shades do start to fade slightly after around seven hours of wear on me. If you want the complete low-down on these beauties, take a peek at my full review. For a real budget buy, we have the Rimmel Scandaleyes pencils. Boasting 24hr wear and a waterproof formula, these shadows are impressive for the affordable price. Although I can't quite vouch for those bold claims, the wear-time of these shadows is pretty decent, only creasing slightly after 5/6 hours. Nothing that a layer of primer underneath can't remedy, though! The semi-opaque colour simply melts onto the skin, making them gentle on the eyes during application. On the lid, the product doesn't feel heavy and the colour doesn't go patchy as you blend it out. But, I do find it difficult to build a strong intensity with this pencil, compared to the others, no matter how much I layer it. With eight colours available, including both mattes and shimmers, Rimmel offer a solid range of shades that are mostly wearable. There was quite a lot of hype surrounding the Colorbands when they were first released and, again, I've done a full review on them already. Supposedly, they're a 2-in-1 product that doubles up as a shadow and liner, but I personally find them too large to line my eyes with. 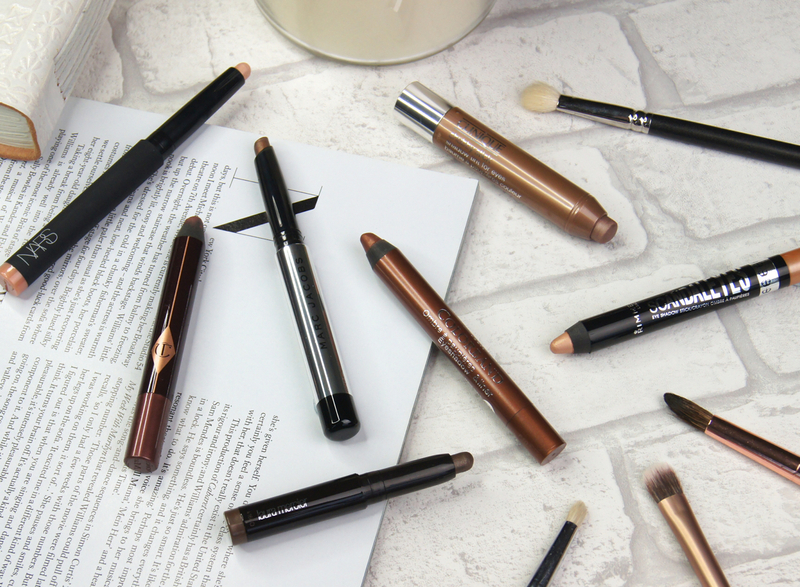 Another high-street brand with big claims, Bourjois state that these pencils are both water and smudge-proof, whilst offering 24hr comfortable wear. I may not have tested them for a full 24 hours, but I can well believe that their claims are realistic, as they're certainly one of the longest-lasting shadows I've tried from the high-street and are on par with the Maybelline Color Tattoos. With a smooth, weightless, gel-like texture, they're a joy to wear. Pigmentation-wise, they require some patience to build up the intensity (the lighter shades especially), but the colour can be layered without a messy, smudgy result. These are another affordable option, but there's only six shades to choose from. What are your favourite eyeshadow crayons? I bought the Marc Jacobs eyeshadow stick when I was in Barcelona, I adore it. It's very cooling when you apply it and it blends wonderfully. As much as I love my By Terry Ombre blackstars eyeshadow sticks, I was quite disappointed ( after hearing so many great things about them) to see that they weren't that long-lasting! I definitely prefer my Bourjois ones when it comes to longevity! The Laura Mercier Caviar stick eye colours sound lovely! I really like the Clinique ones, they're nice and sheer! 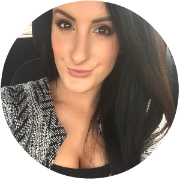 I love the Nars Goddess, pale gold/champagne colors are my favorite. The Rimmel eyeshadow crayons are really fab, as are the Seventeen ones! 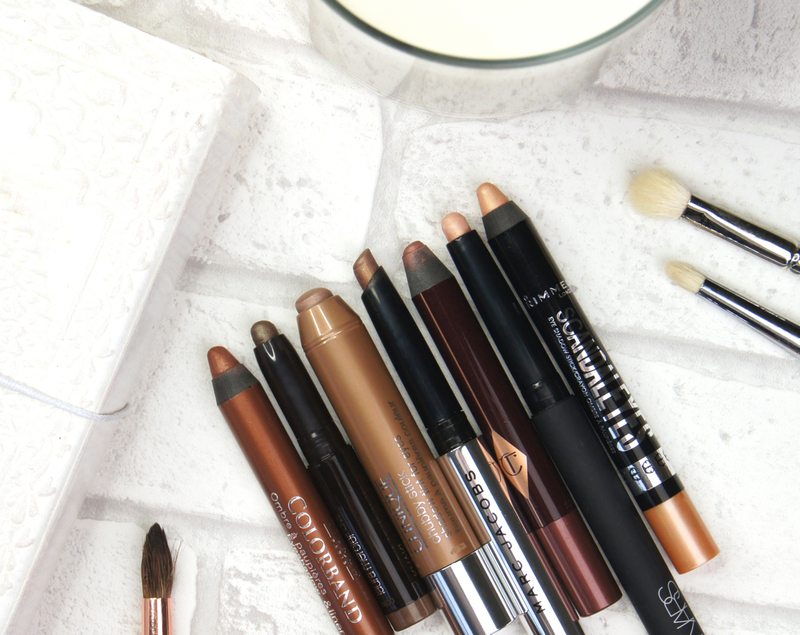 i definitely need to get more shadow sticks, dying to try charlotte tilbury! I love a good shadow stick! Have you tried any by Kiko? The ones in their permanent line are pretty good, and sometimes they have amazing limited edition formulas (the one included in the recent Midnight Siren collection was fantastic). There are many I've been wanting to try for a while in your selection, especially the Laura Mercie! This is a really useful post! I actually don't like the By Terry Ombre Blackstar I have (controversial) it just didn't work for me for so many reasons :( I like the CT Colour Chameleon though so I don't think it's just cream eyeshadows I don't like. I want to try the NARS ones now! Absolutely love the Charlotte Tilbury colour chameleon sticks. They just look so beautiful on and they are so easy to wear. Eyeshadow sticks are so easy to use, no idea why I don't own more! I have a chanel eye stylo that I love. It's in beige dore. I've tried so many but that is definately my favorite!